Promising results from a new study published in the Journal of the American College of Nutrition provide convincing evidence that walnuts can help protect against heart disease. This study, conducted by the Yale-Griffin Prevention Research Center in Derby, CT, explored the health effects of daily walnut consumption by a group of adults at risk for developing diabetes or heart disease. These results are consistent with findings of a prior study conducted by the Yale-Griffin Prevention Research Center team, which found a significant improvement in blood vessel function among people with diabetes who consumed two ounces of walnuts per day for eight weeks. "Our work to date has shown clear benefits of adding walnuts to the diet for people with, and at risk, for diabetes," said Dr. David L. Katz, director of the Yale-Griffin Prevention Research Center, and principal investigator of the study. "To some extent, this is because walnuts are concentrated in a variety of health-promoting nutrients, including omega-3 fat. The results are also probably due to the fact that eating more walnuts, which tend to help us feel and stay full, means eating less of other, less nutritious foods - so there are benefits both from what is added to the diet, and what is bumped out. We now move on to the next question: Do walnuts improve overall diet quality, and help with weight control, for healthy adults? I think so- but the study we are now running will tell us for sure." The adults who took part in the study were overweight, had an average age of 57 years, and had at least one of several conditions (high blood pressure, high blood glucose, high triglycerides, or low HDL cholesterol) that can raise the risk for diabetes or cardiovascular disease. 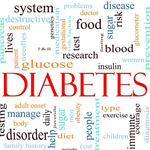 Diabetes, in turn, can raise the risk for cardiovascular disease. Study participants were asked to practice their usual eating habits for one eight-week period called the control phase. Participants were then instructed to continue their usual eating habits for another eight-week period called the walnut phase, with one exception - eating two ounces of walnuts per day while adjusting for the extra calories from the walnuts so their daily calorie intake would be consistent with the control phase. The researchers found that after eight weeks of daily walnut intake, the study participants' blood vessel function improved significantly compared to the control phase, their body weight and waist circumference remained stable, and they experienced a beneficial trend in reduction of systolic blood pressure (the upper number in a blood pressure reading), however that did not quite reach statistical significance. The study results provide evidence that walnuts can play a role in protecting against heart disease in at-risk individuals. The study was funded by the California Walnut Commission. The researchers are currently conducting another study to see if the beneficial health effects of consuming walnuts hold true for a six-month time period for adults who are at risk of developing diabetes.